Available from: The Folklore Society. £10.00. What do Members of Parliament do when they retire? Well when Andrew Bennett stood down as Labour MP for Denton and Reddish, he took on the management of a project to digitise the manuscripts in the Folklore Society's Ordish Collection. His wife Gillian Bennett is a former Editor of the FLS's journal 'Folklore', and he has been an occasional contributor himself. They are also good friends with the current FLS President and Pace Egging expert Eddie Cass, so this seems perfectly natural. Andrew started recruiting a group of volunteer transcribers three years ago, and the FLS has just released a DVD of the first batch of transcriptions. If this sounds like an interim arrangement, it is, and this is reflected in the utilitarian quality of the DVD. In fact, it is better than is sounds, because relatively few of the manuscripts remain to be transcribed. Thomas Fairman Ordish (1855-1924) was the first folklorist and theatre historian to take an in depth research interest in English folk drama. He amassed his collection at the turn of the 19th and 20th centuries, intended for a book on folk drama that never materialised. 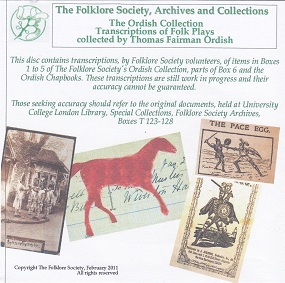 More information about Ordish prepared by Paul Smith, and an inventory of his collection can be found at: http://www.folkplay.info/Ordish.htm. The Collection had a direct influence on the later scholar, Alex Helm, who 'sorted out' the manuscripts for the Folklore Society, organising them into four boxes containing folders for English counties, and a fifth box for Worcestershire, Yorkshire, and 'The Rest' (Wales, Ireland and Scotland, and offshore islands). Box six contains miscellaneous addenda and correspondence, and box seven comprises Ordish's collection of folk play chapbooks. The DVD is arranged similarly, with a PDF file for each box, plus a couple of supplementary files, which I will return to later. The transcripts total some 1822 pages, and while I haven't counted the number play texts, there must be a couple of hundred or more. A substantial proportion of these are primary manuscripts; the rest coming from various publications. The disk has no indexes, nor is there a search interface. This is not unreasonable for an interim edition. This is partially ameliorated by the collection itself, which has contents lists at the beginning of each county, although not for Box 6 or the chapbooks. However, you can search the files for textual strings using Adobe's Acrobat PDF reader. This is not too onerous, given that there are only seven files to be searched - one the few advantages of having such large files. The supplementary files include a brief progress report on the transcription project, and a copy of the 'Notes for Transcribers'. The key thing to highlight from the report is that this is work in progress. Transcriptions are given in their raw state, and have not yet undergone any quality control. Due to the familiar vagaries of handwritten manuscripts, even the best transcribers will inevitably occasionally misread and misspell things, and allowance needs to be made accordingly, especially when searching for names. For example, I noticed a transcript of one song that was collected from "William Purnham, Labourer at Titteby, Vale of Belvoir" [sic]. The surname should actually be Parnham, and the village Tithby. Such errors may not be a problem for many purposes, but Andrew wisely advises scholars to check the originals before drawing any conclusions. He also asks to be notified of any corrections or additional background material, although, to the frustration of would be contributors, he does not provide any contact details. The 'Notes for Transcribers' enjoin them to retain the original layout, formatting, spelling and punctuation - as is good practice - and to add notes where anything is unclear. How well this has been done is difficult to assess because the JPEG images that the transcribers worked from are not included on the DVD, possibly because of space constraints. This is a pity. One hopes that they will be included alongside the transcriptions in the final digitised collection. Original layout does seem to have been retained in the transcripts at least as regards the play texts, which are usually laid out in verse, but one suspects that some of the prose passages have been allowed to run on rather than retain the original line breaks. But perhaps I am being pernickety here. Images of any illustrations, photographs, musical notation, etc, have been inserted in the appropriate positions within the transcriptions, although in some cases they appear blurred, possibly because they have been enlarged from low resolution scans. This approach appears odd in the cases where the originals were printed, such as the chapbooks. Why not just reproduce the original? Well the thing is that these are transcriptions, and these let you search the texts for particular words, something that cannot be done with images (although this is possible with good quality scanned and OCRed PDF files). It has been interesting comparing the transcriptions on the DVD with the few that I have done myself over the years during my own research (but which apparently were not required for this project). Take for instance the item for Wooburn, Buckinghamshire. In the Ordish Collection, this is a longhand copy taken from the Records of Buckinghamshire, 1909, Vol.IX, pp.222-226, with certain abridgements, the most notable of which is the explicit omission of the script of the play ("Then follows The Play ,which I have not copied"). The transcript on the DVD follows the Ordish copy, including the ellipses that indicate omissions, but not replicating Ordish's page breaks and layout. There are only a few errors in the transcription, mostly typos and punctuation differences, but a couple that might be significant - e.g. informant 'James Gassell' instead of 'James Garrell', and 'version current' instead of 'version formerly current'. However, this is feedback rather than a criticism, given that the DVD transcriptions have not yet been proof read. One obvious question about this item is; why has the project transcribed Ordish's incomplete copy when the complete original published article could have been processed? Personally, I think it is good that the copy has been transcribed, because it reflects Ordish's take on the article. On the other hand I think it would be useful to have the full original article too, mainly to provide users with the primary source, but also for the purposes of comparison. What I am suggesting here is that final digitised transcriptions would benefit from the addition of a parallel "Ordish's Sources" section, which would also include the originals of sources copied for him by his correspondents. Another interesting question arising from the Wooburn item is; why was the play script omitted? This seems very curious. Could it be that Ordish owned a copy of the relevant issue of the Records of Buckinghamshire, or an offprint of the article, and did not feel the need to copy it? If so, why did he bother with an abridged copy of the introduction? One last question (which has implications for the earlier questions) is: who made the copy of the Wooburn article? I am not especially familiar with Ordish's handwriting, but it looks to me as if this item may not be in Ordish's hand. Users of the transcripts have no way of knowing this without access to the images of the originals or suitable annotations. Although I very much doubt that it would be possible to identify the scribes for all the handwritten items in the Ordish Collection, I suggest that it would be useful and practicable to annotate the transcripts of those items that are written in Ordish's hand. The English Folk Dance and Song Society (EFDSS) recently announced that the collection is among those it hopes to include in a joint web portal, to be funded by the Heritage Lottery Fund. The collections currently on the EFDSS website are varied in format and search options, so it is too early to tell what form that the final digitised collection will take. I rather hope that the final version will have a page for each item, which seems likely, because I think that most users will wish to extract or print off individual texts, or cite links to individual items in their publications. This is difficult with the current large PDF files. It is also important that the full texts of the manuscripts should be searchable online. Only the catalogue entries can be searched at the moment for the material that the EFDSS already has online. The target date for the appearance of the final version is not stated, but I expect it will take a few years to complete all the proof reading, editing and annotation. I therefore think that interested folk play researchers would do well to buy the disk now rather than wait, especially as it is so reasonably priced. This DVD clearly represents excellent value for money, and will be of considerable benefit to folklorists everywhere. One cannot help but be impressed by the volume of work Andrew's volunteers have done in transcribing the Collection, and I look forward to seeing more from them in due course.